This one was spotted in Culver City in the parking lot of the starbucks on Venice and Culver. That truck is taking up two spaces, and sticking out a good 5 feet into the drive area. Totally sweet and a lovely follow up to the previous praking idiot. 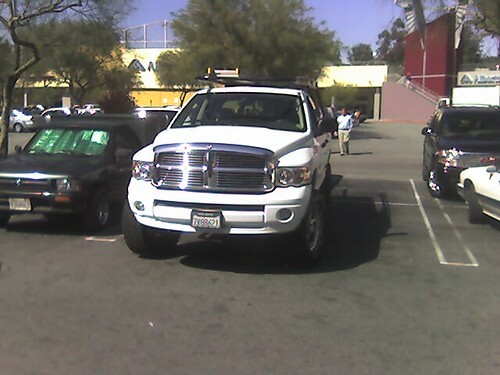 After seeing your previous post on this subject, I was inspired to write on a sticky note in a parking garage near LAX: “Your vehicle is NOT a compact!” and stick it on an offending SUV’s driver-side door. The SUV in question took up nearly two compact spaces! Why not let the offending drivers get a note about your opinion? They’ll go nuts looking for the damage. I have a 98 Taurus and I dont care too much for the paint job. In a situation like this, I’ll block in their driver seat door and go on and do my business. This is a big pet peeve of mine and inspires serious rage. When I used to have a minivan I was forced to park in compact spots at my job’s parking structure. If compact car owners would actually use the many compact spots instead of taking all the full size spots I wouldn’t have to use a compact spot. BTW, if someone blocked my driver’s side door with their car (purposely or not) they were left with a dent, scratch, broken passenger mirror or a flat tire or two, depending how much time I had.